Want some finger lickin' good sticky chicken? This Guinness Chicken has your name on it! 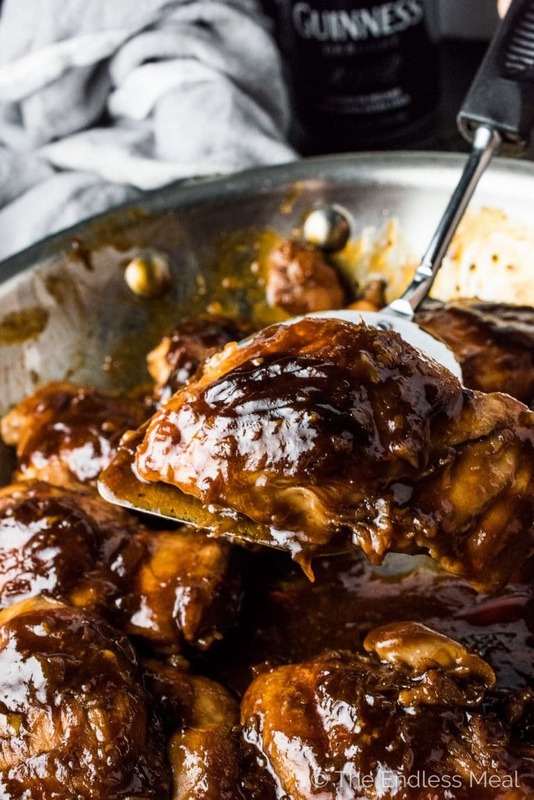 Chicken thighs are first seared light brown then cooked in an easy to make sticky sauce made with your favorite Irish beer. It's my newest favorite chicken recipe! 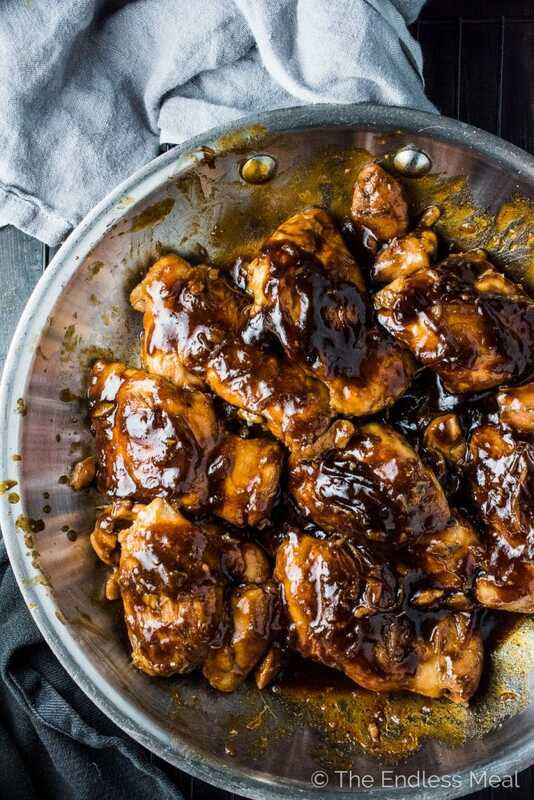 Sticky Guinness Chicken for the win! ? 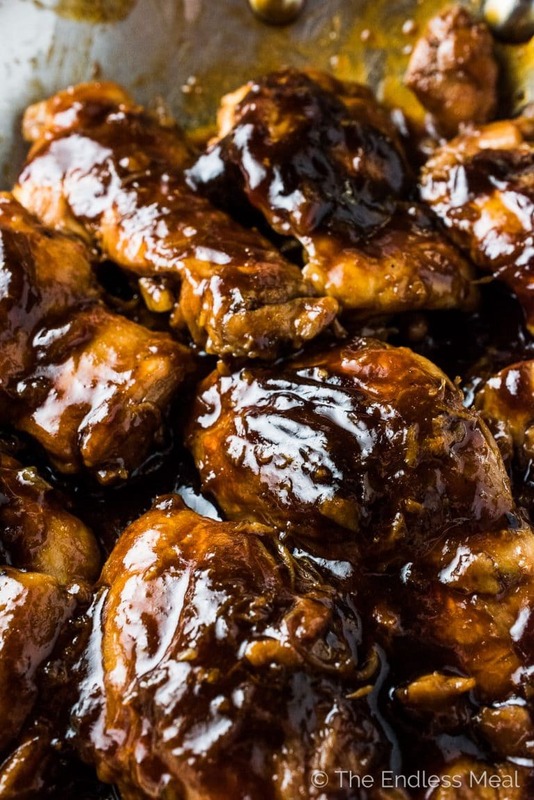 Those mega glazed covered chicken thighs are one of the best things ever. Sweet, sticky, and full of our fav Irish beer. St. Patrick's Day is just around the corner and pouring Guinness into just about everything seems like the right thing to do. It's a little like Guinness BBQ sauce which is extra awesome because summer is still a ways off and I'm big time craving smoky, delicious, grilled flavored anything. 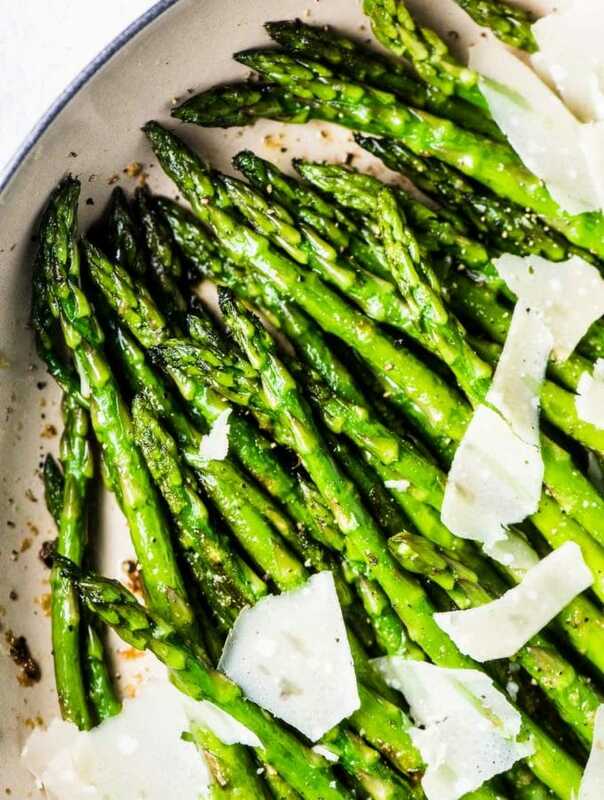 Quick and easy dinner calling your name over here! 35 mins, start to finish. With a bunch of hands off time so you can throw some potatoes in a pot and some salad in a bowl. Sticky sauce mention #2. You guys, it's just too good not to mention again. 1. Boil the Guinness, ketchup, honey, balsamic, Dijon, and garlic until it starts to thicken. 2. Brown the chicken while the sauce is boiling. 3. Pour the sticky Guinness sauce over the chicken and let it bubble away until it is nice and thick and the chicken is cooked. 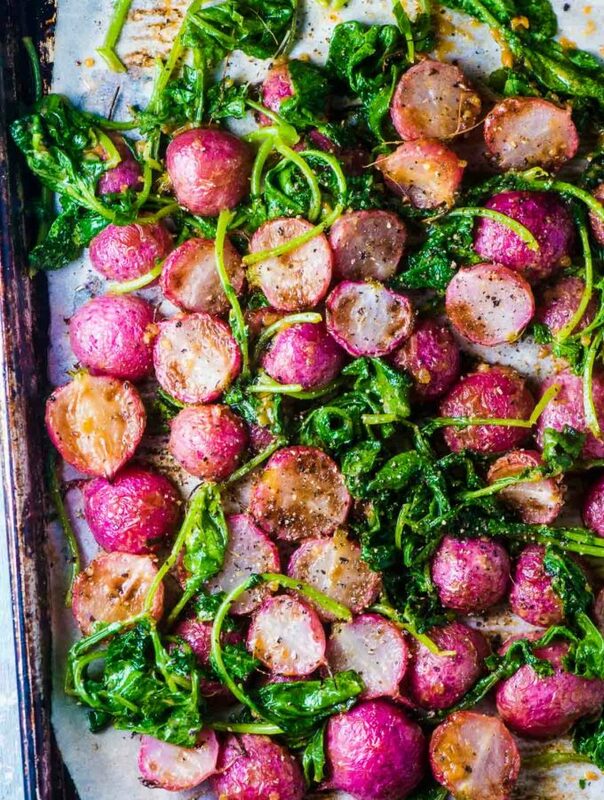 And don't forget about these St. Patty's Day recipes! Add the Guinness, ketchup, honey, balsamic, Dijon, and garlic to a small pot and bring to a boil over high heat. Reduce the heat and simmer for 15 minutes, or until it starts to thicken. While the sauce is simmering, start the chicken. Heat the oil in a large frying pan over medium-high heat. Add the chicken to the pan and brown it on both sides, about 10 minutes total. Drain the fat from the pan. 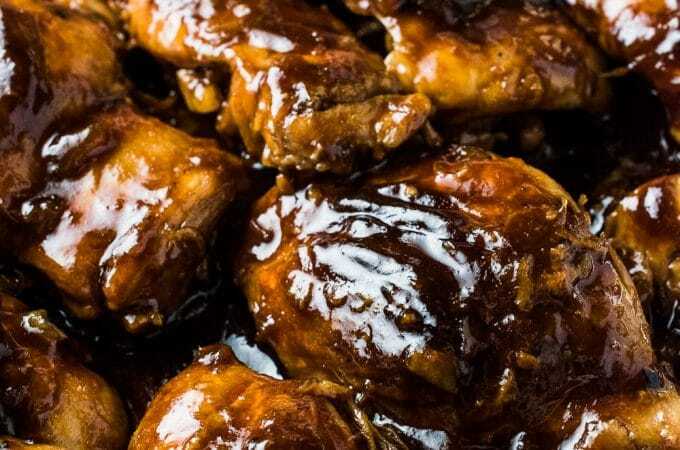 Pour the slightly thickened Guinness sauce over the chicken and continue to cook the chicken, turning it over a few times so the sauce coats both sides, for about 15-20 minutes, or until the sauce reduces and is thick and sticky. I, too, had some difficulty getting the sauce to thicken while simmering in the pot. However, once we poured it over the chicken on higher heat it did reduce down and thicken a bit. It never got to “sticky,” but I am going to blame that on my error somewhere. We used chicken breasts instead of thighs, and due to the high heat cooking with the sauce some parts of it looked burned, but the taste was still wonderful. I may need to experiment some more in my skill with this recipe, but it’s still a wonderful recipe! We may add 1 tbsp of brown sugar to the sauce next time (just for preference). Half the fun of cooking is the experimentation! Thanks for providing such a great recipe for us to use up some Guinness. 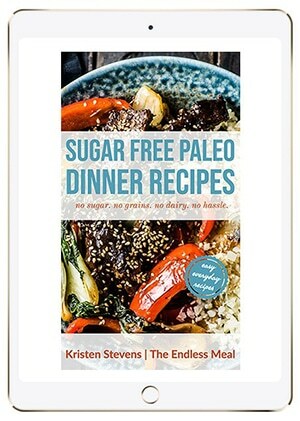 Made this recipe exactly as it and it was a hige hit. The sweet glaze was amazing. Everyone wanted more! Mine didn’t get thick no matter how long I boiled it before or with the chicken. What did I do wrong or what can I do to thicken it next time. Husband loved the taste but it was more like thin soup than a thick sauce. How long did you boil it for? Once the liquid evaporated (from boiling it) then it has to thicken. If a sauce is taking longer than I think it should I’ll sometimes increase then heat so it rapid boils and then it’s usually only a minute or two till it thickens. Hello, my sauce also didn’t thicken on first attempt. I ended up the next time pre-baking the chicken with salt pepper and cornstarch coating. Then dipping the chic in the sauce and baking a little further. It has a great taste! I’m so happy you liked the recipe! Good call on the chicken breasts, too! Thought I would try making this tonight, I only have skin on and bone in thighs. Will this still work? If you want the chicken smothered in the sauce, I would pull the skin off the chicken as it won’t be nice and crispy since the chicken cooks in the sauce. Bone in is totally ok! The other thing you could do is crisp the skin in the pan first then pour the sauce into the pan being careful not to get any on the skin. Then cook the chicken without turning it so the skin stays crispy.